Twelve of the most fun questions on the SAT (kidding — they’re as boring as anything else on the exam) are grid-ins. 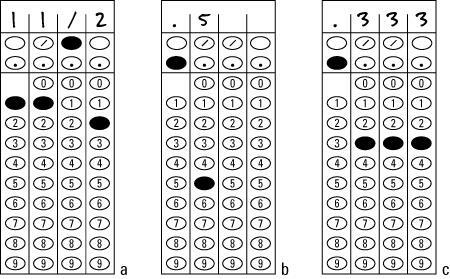 Sadly, you don’t get four convenient multiple-choice answers for a grid-in. This figure shows a sample blank grid-in. The grid-in problems are normal questions of any type but tend to be in the higher difficulty range. The last question of the long Math section, Question 37, is an especially challenging grid-in and worth 4 points, unlike the other questions, which are worth 1 point each. Write your answer and then darken the ovals. Grid-ins have little boxes in which you can write your answer, but the scanner doesn’t read the boxes, just the darkened ovals. But even though only the bubbles are scored, don’t skip the writing part, because you may “bubble” inaccurately. You can’t grid in negative numbers. The grid has no minus sign. Hence, all answers are positive or zero. Don’t grid in a mixed number. If you grid in 5 1/2, the scanner reads “51 over 2,” not “five and one-half.” Solution: Convert your answer to an improper fraction. Grid in 11/2 (11 over 2), as shown in Figure a. You may also grid your answer as a decimal: 5.5. Three grid-ins, properly filled in. You can start from the left, right, or middle. Just be sure that you have enough boxes for the answer you want to record. Don’t place zeroes before a decimal point. If your answer is .5, darken the oval for the decimal point and the five, not 00.5 (Figure b). If your answer is a repeating decimal, fill in all the boxes, rounding off the last number only. In other words, darken the ovals for .333 or .667 (1/3 and 2/3 expressed as decimals), not .3 or .67 (Figure c). If your answer isn’t a repeating decimal (.4, for example), you don’t have to fill in all the boxes. Just darken a decimal point followed by a 4. Don’t agonize over the perfect, correct answer. Some grid-ins have several possible right answers. (Usually those problems say something like “one possible value of x is . . .”) Just find one answer and you’re all set.